We got out! Last winter, we did not. We staycationed it in Minneapolis and it was miserable. Minnesotans need a getaway and timing is critical. If you vacation in January, just know it might be miserable to endure three more months of winter. End of March, some Minnesotan’s might argue, is an ideal time. It’s also spring break. In the process of writing an article on family travel planning for May 2015 MNParent, I talked with Linda and Jim of Pique Travel Design. Vacations with your kids throughout their formative years are opportunities not to be missed. We cited the anticipation and planning for a trip as well as having more long-range travel on the horizon to look forward to, as top benefits. I expanded a bit on the planning for trips in my April blog, The Pros of Family Travel Planning. When March 27 rolled around this year, we were ready to vacate the state. 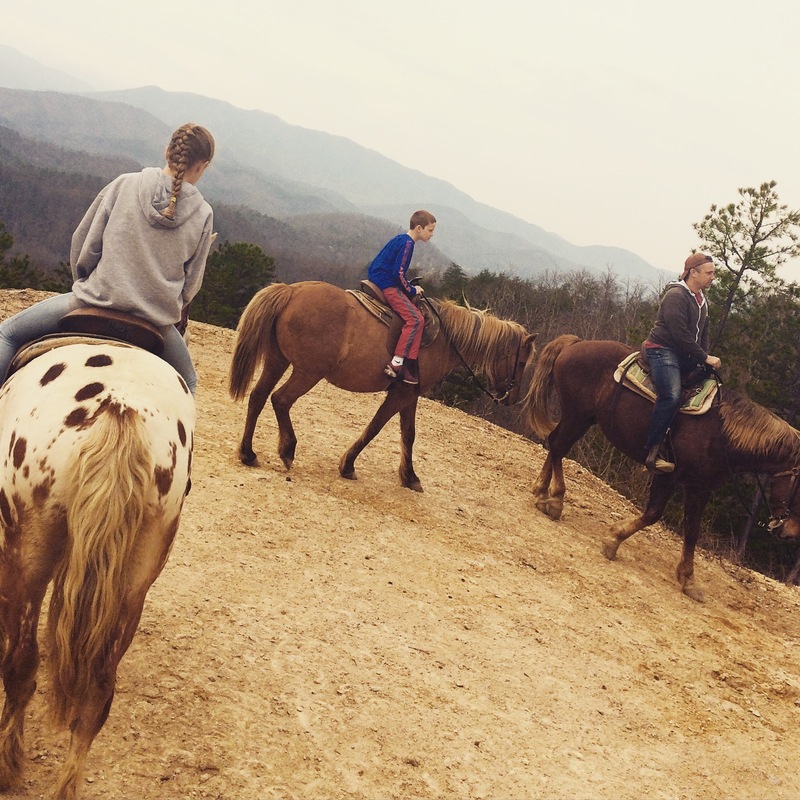 Our 8-day road trip, with a final destination of the Great Smoky Mountains, started out rocky. On the Wednesday prior to our Friday departure, my husband volunteered to host my son’s baseball kick-off meeting at our house. After shrugging off disbelief to this type of commitment, all four of us stepped up our game Thursday prior to the trip (and baseball meeting) for 2. 5 hours to whip the house into fine shape (I mention this because it was awesome to come home the following Saturday to a super clean house). When everyone arrived, my 11-year-old daughter, Ava, and I left for our scheduled pre-trip Target run. New stylish, but cheap, sunglasses and sweet and salty snacks packed, we headed out the door 6:45a.m. on Friday. After an hour of chit-chat and a fair distance away from metropolis, I pressed play on one of five audio books I checked out from the library. Harry Potter didn’t garner much attention. All four of us were too focused on our individual tasks: driving, Clash of Clans, Minecraft and Martha Stewart. I would attempt again later. Originally considered a type of fly-over destination on the trip, St. Louis proved to be rich in history and monumental. But then again, every city is. It’s about seeking out a unique experience. Thanks to Ava and her trip research, she discovered the Delmar Loop historic district in SLP, ranked among top 10 Great Streets in America by the APA. We arrived at 3:00 and checked into Ava’s booking suggestion, the Moonrise Hotel. Within walking distance of retail, restaurants and shops along St. Louis’ Walk of Fame, we spent hours combing the memorabilia of Blueberry Hill and throw back candy stores. We topped it off with bowling at Pin-Up Bowl, just next to our hotel. The next day, after a visit to Winslow’s Home on Delmar, we headed to The Gateway Arch. It was a bright, sunshiny day so we started with a walk through downtown and visit to the St. Louis Old Courthouse, where Dred Scott was tried. The kids were fascinated with the story and Ava could lend some insight as she had just studied slavery and the Civil War. We purchased our arch tickets and walked through the historic courthouse, currently undergoing restoration. Up my alley! After an expected wait in line to get into the underworking of the Arch, we learned the South Tram was shut down (there are two tiny trams, one in each arch). We agreed the delay would be worth it and 1.5hrs later, we ascended to 630 feet via the North Tram. With our family and a stranger in the five-person tram, it felt quite claustrophobic (people in 1963-1965, when the arch was built, were smaller than modern-day Americans perhaps?). The views from the top through tiny windows that you leaned over mimicked both in-flight and free-fall feelings. An architectural and engineering feat undoubtedly that left us feeling a bit uneasy and happy to make a safe descent. We arrived 3 hours later in Louisville (pronounced LOO-ee-vil) with our accommodations booked en route, as we had left this night to chance. The Galt House was hopping and Saturday night was in full swing. Around 8:00 we headed out to explore via foot, the Yum Center, Whiskey Row (yes, with the kids) and dine at DocCrows in the midst of the Kentucky vs. Notre Dame game. The southern smokehouse and raw bar proved one of the best meals of the trip. Most rowdy experience? A group of people in the lobby using adult language to the extent that the wife told her husband, Mouth Up. Calvin, my 9-year-old, thought that to be hilarious. 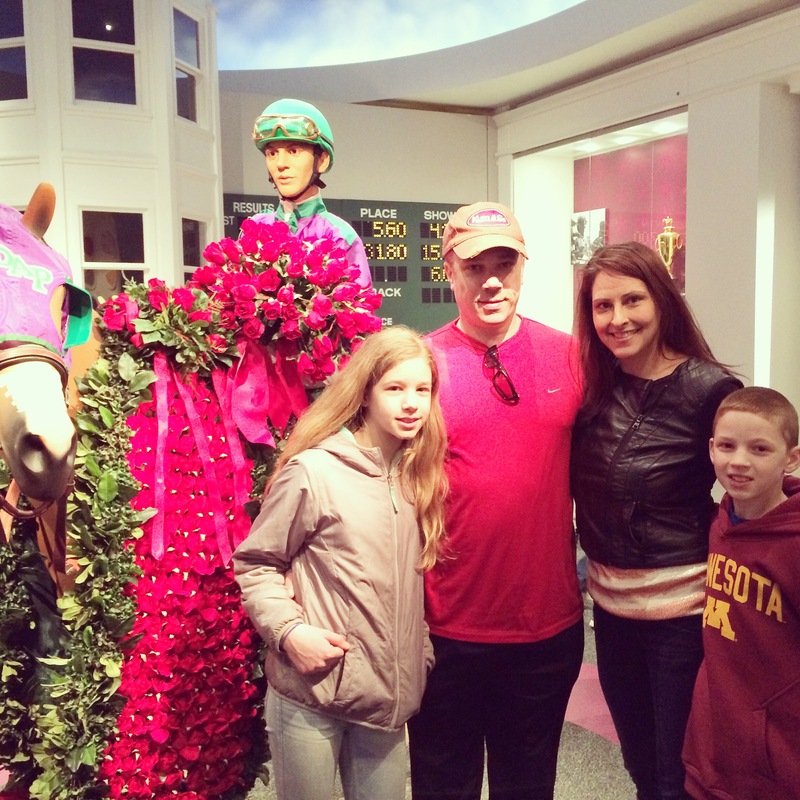 On the way out of the city on Sunday, we visited Churchill Downs for the tour and museum package. Excitement was definitely building for the 141st season of The Kentucky Derby (coincidentally, starting now). The museum had surrounding video screens to capture the spirit of the race during a 20 minute video showcasing the history and the greats from horses to jockeys including Calvin Borel. Four hours later and a side detour based on my husband’s request to wind along the Kentucky Bourbon Trail, we navigated into Nashville. 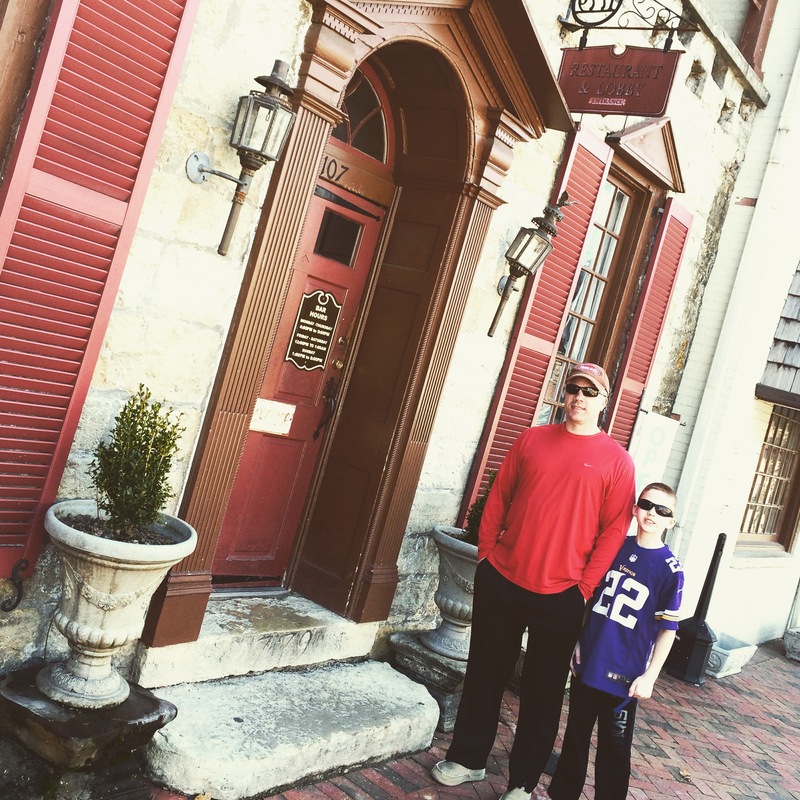 I will say the wandering included lunch at Bardstown, a quaint little town whose claim to fame is Most Beautiful Small Town in America. The Vanderbilt University area of Nashville, just SW of downtown, found us in another Ava-booked accommodation: Homewood Suites Vanderbilt by Hilton. With two nights ahead of us, we were happy to enjoy the awesome comp happy hours, dinners, breakfast buffets and sizable salt-water pool (the largest pool in their new model of Homewood Suites, according to the manager). On Sunday we went to Perfect Pizza in Hillsboro for dinner and retired early. Monday, Mar 30, we ventured into downtown Nashville. It was an easy drive. We parked in the huge, new Nashville Music City Center (convention center) and happened upon the Country Music Hall of Fame. It was such a beautiful day, that we opted not to visit there, but head over to The Ryman, the birthplace of the Grand Old Opry. We so enjoyed The Ryman (currently under restoration) and the backstage tour where we heard stories about Minnie Pearl and Johnny Cash and the greats that graced the stage. Chad recorded a song he wrote in their sound booth for $25. We had plenty of time to walk Honky Tonk Row, have lunch in an open-air cafe (as Minnesotans, we were totally giddy about this), check out the shops and hop on a trolley for a city and environs tour. The capitol and grounds was worthwhile, then mid-tour, we hopped off at the Parthenon, just next to our hotel. We basked in the sun at the park for a good hour and hit the pool (again!) for a quick swim. After we took in dinner at the hotel, the kids were on their own. A grown-ups must-see? 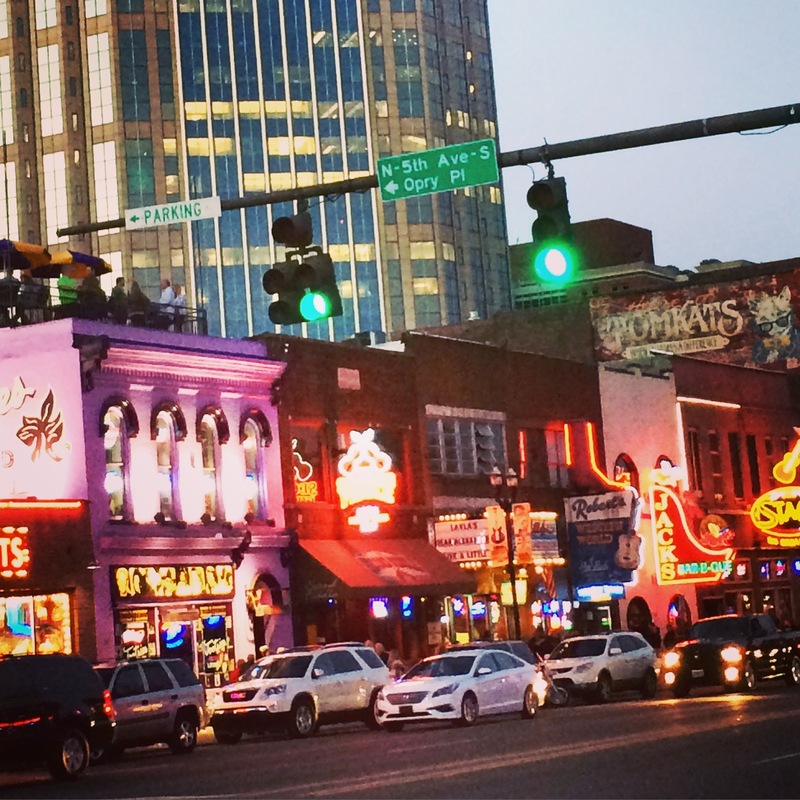 The downtown scene of Music City. With live music on every level and every stage in every bar, we visited three touristy joints before inquiring with a local to find the off-the-beaten track venues (Printer’s Alley). Date night. Check! After our cross-TN journey, we wound around narrow, climbing roads and arrived at our cabin for a three-day stay. 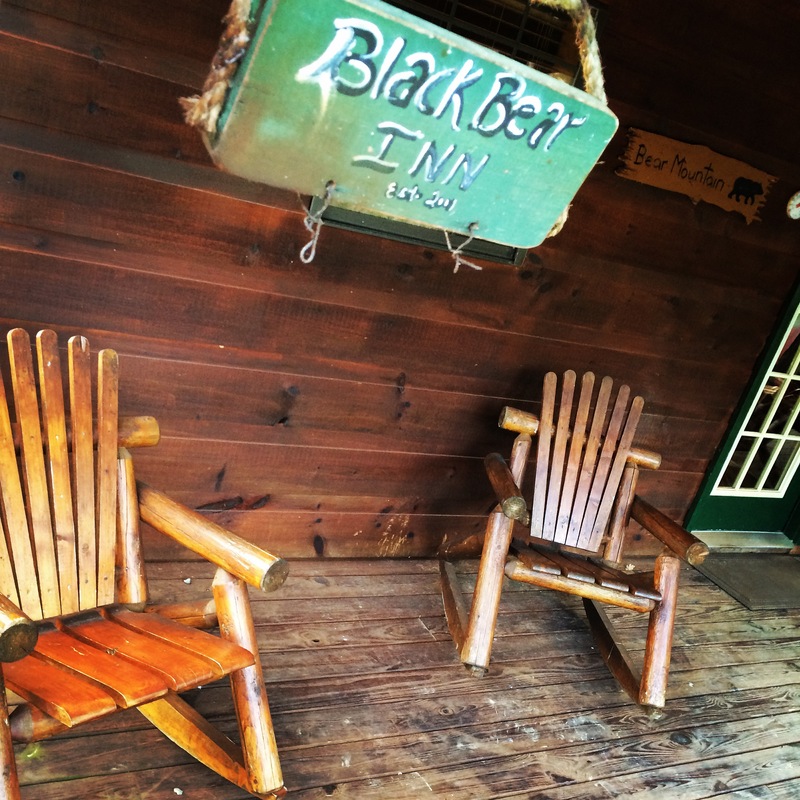 Our Black Bear Hollow Cabin with its three floors and decks, pool table, hot tub, fire pit area, isolation and views of the Smokys, at $150 a night was a steal! This lodging pick courtesy of my husband, found us in Townsend, TN, by the Cades Cove area of the Smokys. Already day five of our trip, we were in vacation relaxation mode and ready for a night in. We had a fire in the fire pit, enjoyed the hot tub and planned activities for the next few days. Upon waking up Wednesday morning, April 1, we were ready to see the mountains we had travelled all this way to see. We were refreshed and ready to hike, so we ventured out from Cades Cove (on the western side of the park) to see Abrams Falls. It was a decent elevation over a round-trip 2.5 hour hike. We were starved though. Somebody forgot the picnic we packed…. After R&R at our cabin, our curiosity about Pigeon Forge and Gatlinburg got the best of us. Just 15 minutes up the road, the kids and Chad did an Alpine Slide in Pigeon Forge for $15 a pop. We marveled at the rise-in-place tourism mecca of every tour for kids imaginable – buildings built like pirate ships, a Jurassic Jungle and more. We did not stop. Gatlinburg was retail, restaurants and entertainment. The kids loved it – one big amusement park and American fun factory. Chad and I were ready to tap out. Thursday morning, we loaded up on allergy pills and headed just down the road two minutes to Next to Heaven Horseback Riding, where they tout unguided tours with the most scenic routes. We had passed a few other options in the flatlands, but this just appealed to us. We got a two-minute overview, then got on Liberty, Dakota, Huck and Dusty for a one-hour tour. It was indeed scenic. These sure-footed horses made me most uneasy in trot and downhill mode. Chad and Cal relished in the adventure, Ava and I were a bit more cautious. It was elating, but I was happy to be back on my own two feet! It was starting to get a bit overcast after our post-horsebacking riding rest, but we continued on with our plan to venture further into the Smoky Mountains. Townsend, north of the park, was an hour-long drive into the park and our destination along Clingman’s Dome Road, a seven-mile stretch of road to the top. This particular road, only open seasonally, had just opened April 1. As we climbed, the fog (or blue smoke/ purple haze) enveloped us and about 4 miles in, we turned back. No doubt upon reaching the top, the fog would prevent a view of anything. Instead, we hung out at Newfound Gap at the Tennessee and North Carolina border. After a full day, Friday morning, April 3, had us packing up to say goodbye to our lovely little cabin. We logged 12 hours of travel-time that day before reaching our friends’ home in Chicago. There would be no sight-seeing in Chicago. I had set that expectation at the onset. Chicago would be a return trip and weekend visit during the summer. We slept well. The six hour drive back home to Minneapolis on Saturday seemed a breeze compared to the day before. We were happy to be home.